Thoughtful readers such as you often stop by. In this post you are invited to join others in cataloging the derangement of public policy. Members of our ruling class keep saying the most absurd things and not worrying that we hear them. Part of the reason for this is that they are expecting nobody will quiz them on their irrationalities. In one way or another, their allies are running things in just about every media outlet you can imagine, so real hardball will not come from there. When they do get cornered by members of the country class, it may strike you that a wolverine is less vicious; and a wolverine doesn't pay thugs to lurk in the shadows awaiting a signal. Without giving a single specific instance, I'll name four frequent violators: Nancy Pelosi, Barney Frank, Al Gore, George W Bush. Some more, some less, but they all do it. An example would be citing the Prez or some Senator claiming that we can have universal health care at less cost while not needing to ration under ZeroCare. This is what comes of allowing our institutions to slip into the hands of those who crave power to run things. Even simple arithmetic becomes nonsense in their mouths when it gets in their way, so it should never be surprising when they speak of more complex ideas. I'd love for readers to leave in the comments specific instances. I'll add those I like to this list. Left to the schemes of Harry Reid, we may lose the opportunity shortly. According to DISCLOSE Act Assault on First Amendment Continues, "you better take advantage of that while you can." Read the rest, it's not long. The essay by Angelo Codevilla has captured the imagination of a great many. It occurred to me that slightly updating and republishing this old essay may prove useful. It highlighted key areas where our wannabe Ruling Class fostered actions that undermined our good cultural influences and promoted bad ones. The latent excesses in human nature had been greatly suppressed by institutions that our ancestors had built for that purpose. Local community checks on excesses were a Puritanical legacy. That key foundation I think was targeted first. Then anything that could be linked to it became fair game. It took about three generations to near thoroughly inflitrate and rot out most of those institutions. We are the people the globalists have been waiting for: us foolish caretakers of America, descendant guardians of the liberties she was created to safeguard. Have we so fumbled that we've fatally lost the baton? I want to thank fellow Belmont Club member Cowboy for commenting on PrezZero's shunning of the Boy Scouts of America's Centenial Year Jamboree. [The BSA is] the one institution [the Progressives] founded that’s worth a damn. It’s actually the crown jewel of their legacy had they eyes to see it, and boy do they hate it so! That strongly reminded me of a similar passage in another of my essays that itself was influenced by the following. The Ruling Class' hatred of all our earlier liberty-guarding institutions begs us to reform them all. Let me share a 1970s memory of a published interview with the dean of the Harvard Business School. The dean lamented his own participation in the new business ethic. I asserted one week earlier that morality is only applicable for oneself by oneself. Now I will present the case why it is wise to choose to do so. Self-interest. Long term. Optimism. In the case of the corporate CEO, a moral corporate outlook, indeed the outlook of any morally restrained leader, requires a level of nobility of purpose that our mea culpable dean and his generation of educators had chosen to cashier. Much of moral outlook frequently takes the form whereby one chooses that self-interest extends beyond the self. Heroes in war and in fiction abound in this. Restraining ones immediate appetites for the purpose of advancing some loftier goal is a choice that is always available. Yet the inclination to same has so fallen out of favor with the self-anoited intellectual crowd, who have given it such pejorative appelations that they can vex a saint, that you sense that the intellectuals have long-lost any sense of nobility themselves. How could this be? But what about what you do, Dear Reader? Over what of your many choices of behavior have you thought long and hard about? Who have you approached for advice? Have you even consulted your own experience? Statism needs not oppose or control all its leading opponents directly. It is most Machiavellian where it abets advancement of a few on whom it believes it has a handle or two. So then, when the moment is ripe, it grabs hold and twists. Today -- thanks to Crusader Rabbit for the heads up -- I'm pleased to note that I am now joined by Rush Limbaugh. He too now openly labels the media as the Ministry of Truth. "The Democrats and the Ministry of Truth, the American Left, they will tell us who they are most afraid of..." by who it is they attack. Now that Rush is using Ministry of Truth, others will follow suit much as so many of us are now using "ruling class" instead of various forms of "empowered elite" since the publication of Angelo Codevilla's landmark essay. As much as I am happy that Rush is using the term, I wish to demonstrate how Rush is not yet ready to admit how other key Orwellian specters are present. The subject of which Rush is expounding here I disagree in part. That is due to the truth of the observation at the top of this essay. Didn't Rush learn from the behavior of the Left and MSM to GWBush? It appears not. Bush was not as much of a threat to the Left as he was to conservatives. Especially in 2008 where the Left was using GWB as a punching bag allowing the Statist agenda to advance as resistance to all of GWB's moves from the Right was depicted as Leftist inspired. The Country Class knows it's been had, but spokesmen like Rush will not allow that the methodology that Statists's used to gain the advantage be considered like a chess game. The Left will always hate a conservative. But DO NOT let their noise affect your judgement! For the Statists buried in the GOP and (due the various handles on them) will or won't attack a conservative depending upon the perceived threat to the Statist agenda. The Ruling Class, as the Progressives have always done, lets the actions of the radical Left do their dirty work. Then the Progressives get between the radicals and the Country Class and demand that WE be reasonable. Creeping Statism has worked time and again that way, so they are not about to stop unless WE stop allowing ourselves to be duped. The Statists, aided by the TARP and Stimulus monies that have no accounting attached to them, have never found their rigging of the system to be so easy. For all their Machiavellian cleverness, the Ruling Class has a major weakness. What more does Arizona need to know? Now They're Going Too Far! seem to be succeeding at getting Obama to bring the equivalent to America. Now is the time for a real Washington Monument Defense! Political Cowing and Cowering 101, On-going classes. An effort to preempt all discussion and criticism as "racist." An effort to preempt all discussion and criticism as "Bush-Bashing." Anyone reading this blog knows of people who fit these descriptions? Do you know of any who finally recognize what useful idiots they are? I thought not. Lots of excuses though. The next iteration is found below the break. 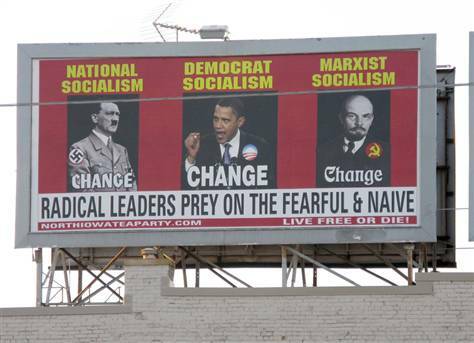 The following billboard (h/t JammieWearingFool) was removed today after a firestorm erupted over it. and the opinion expressed in the Billboard poster is way too close to the truth. You all know it's true that the "Progressives" have moved beyond brazen. They know you know, and are waiting for you "Reactionaries" to, er, react. But did you realize that they've been practicing being openly brazen for years? It's just that nobody noticed? If this were not being addressed to a philosophy audience, I could probably stop here. The guidelines and framework [proposed here] are likely to be useful only if we recognize that each real-world implementation is going to be radically different, peculiar to its own region. In principle, there may be a general framework for ethical sustainability, but in practice there are only local democratic attempts to bring about some approximation of it. "No. There can be no best ethic because it's a matter of what we can get away with in each locality." You see, people don't like being blocked in their efforts to provide a living for themselves and their families. And they really get pissed when they find their very lives being written off. So any open efforts to eliminate large numbers of human beings needs to be done surreptitiously. If the Sus worshippers can get us to kill each other, and their hands are not directly implicated, they have a win-win situation. Now read again my second paragraph above. Is that right, Ms. Ann Thrope? News flash: the Obama administration to issue new offshore drilling moratorium today. Over-riding the courts. We are in a state of tyranny; proximate objective, 4 or 5 dollar gasoline ASAP. The hope for a gentle transition to the admin’s backers’ ‘green energy’, down that big drainhole in the gulf – put there by a set of nigh-unrepeatable April 20 rig-floor actions inexplicable and akin to nothing so much as drinking a glass of gasoline and dropping a lit match in your mouth. The Mississippi Canyon horizon and the other deep water projects underway were going to be America’s energy saving grace – reasonably priced fuel to grow our economy on far into the future. Now in process of ruination by the hand of the administration, as far as all the signs point. And behind the scenes, watch for the Chinese government to buy out BP’s Alaska holdings, in order that BP can pay off its damage claims. Crocodile tears from BP. Foreign sale subject to congressional approval, of course – so it won’t be long before the dragon raises its head. It’s wartime –the USN has attacked Pearl Harbor, Dolittle’s Raiders have ditched on purpose short of the target, and the Midway fleet at Point Luck is scuttling itself. From the Belmont Club Thread "Tomorrow Belongs To Me"
Andrew Klavan today forced himself to face the truth. The fascination with celebrity—the fascination with artists above and beyond the works they create–is, in effect, the opposite of wisdom. It is honoring the fool whom God inspired rather than engaging with the wisdom of the art he was inspired to make. The fascination with celebrity is the opposite of wisdom. It is a painful truth, especially for someone in Mr. Klavan's line of work. But it is mandatory that we search over a broader range for our leaders, and almost certainly from humbler walks of life. The best leaders who might serve us now will not seek to be boss, but will have the vacancy thrust upon them. The paramount reason to seek out those who have a history of restraint repeatedly turns up in human nature. The very first sin recorded in scripture revolves around this aspect of human nature. You need not believe in God to see that primitive people understood this danger better than the majority of our contemporaries who voted for all the scum that's risen to the top in the last score of years. Note below the two labels I've put on this post. Think about how they apply, and resolve to do better by convincing our neighbors not to fall for them any longer. Ayn Rand Loved Titans, Not Mankind? Atlas Update: Web-searches suddenly hit here on May 21, 2011 -- Why? Here’s a challenge for Randians. What Marx provided the Leftists, Rand provided the Statists: a false flag behind which they hide their true intentions from the gullible. Consider that Rand’s pièce de résistance was titled for a bloodless titan. Consider that she kills, without any sense of loss, the two most identifiable and likeable humans in her novel. Taggert’s wife Cheryl1 commits suicide out of frustration and despair. Eddie Willers is torn apart by the mob while doing his job beyond the call of duty (like the men we remember today*). He did it in habitual defense of the property of Rand’s “heroine” who had herself abandoned the field without telling him, her long-time loyal friend. Dagny (Rand?) displayed no gratitude. Initially I very much liked Atlas Shrugged. It seemed a welcome antithesis to the Leftism that was whirling for the 40-50 years on either side of its publication. So what first alerted me to the deceitful side of Rand? The actions and words of her most lauded acolyte, Alan Greenspan. When Greenspan said “who in their right mind would buy a 4.5% fixed mortgage when a 3.75% variable is available?” I knew he either was intentionally deceitful, or someone had something terrible they used — and he succumbed — to get Greenspan to abandon those who trusted him. Like Rand did Willers. I’d like to know: Am I the first person you have read to make this observation about Rand? I’ve not seen it written elsewhere. Could it be because those on the Left, who are more inclined to criticize her, would never make such a comparison? And certainly not from the libertarians who shun from their ranks any who did not conform to a certain level of coldbloodedness. Nor from the corporatists (often mistakenly accepted as conservatives) who we know seek legislation that gives advantages to themselves and disadvantages, cripples or demolishes their competitors. On this day of remembrance, where acolytes and apologists of Rand are among those who question the wisdom of willing self sacrifice, I’d like to hear a defense of her attitude to the common man. Not the “man” she paints as a defiant titan like Galt or Reardon or Rourke, and of independent means, but a common man who is a success in his own right, in the decent things he does and the loyalties he demonstrates — like Willers. For the rest of you, this day for remembrance of fallen heroes may be of aid when you decide it is time to jump out from between the jaws of the tyrants’ vise. And I'm not saying that providing cover for the Statists was Rand's intention starting out. It's simply that her philosophy didn't consider all the ways in which schemers could use her thesis. And surely her advancement, especially in Hollywood, had something to do with her brilliance being seen as useful by the power seekers. As her cult of personality grew, surely she came to love her adulation. She may have chosen to look the other way as the Statists took advantage. She was too bright not to have noticed. *Note, the bulk of this was written on Memorial Day and referenced here and published here. But it deserved a place at this site because I'm pretty sure Ayn Rand was no fan of Blaise Pascal. He'd have seen her as just another casuist who lost her moral underpinning. 1It surely seems that in this crowd of Objectivists, none see what I am proposing. I suspect it is because of their reverence for Rand. Are they misled or have they willfully permitted themselves to be misled? "Tomorrow Belongs To Me." So argues Kevin Drum. Writing in Mother Jones he argues that despite the electoral apocalypse facing the liberals in November, minorities and the Millenial Vote are going to give the Democrats — in the long run — the permanent majority. I find it reassuring that our host is not fearful of being charged with having violated Godwin’s Law. Many years ago, I heard Hugh Hewitt use Godwin as an excuse to cut off more than one caller. On one occasion, I thought he said “you lose” as he cut the call. I got the impression he rather enjoyed invoking it. And it didn’t seem to matter how substantial was the caller’s argument, it was simply a matter that Hewitt, maybe fearfully, did not wish to see his show accused of a Godwin violation. Or maybe, on that day he gleefully said “you lose,” he simply did not want to entertain that direction of thought, and he used Godwin as the excuse. And now, after all those little Left-wing and Statist encroachments on our liberties have built up so heartily while our guardians of access to Right-talk radio prevented the sane and rational comparative argument while we still had time, we must face the consequences of our side having allowed itself to be silenced by means of Political Cowering. So, for now, we must bear the crowing from the Left and Statists: ♫And Tomorrow Belongs to Me♪♫. While reviewing yesterday's post that was very critical of Dennis Prager (a day when I was also critical of Michael Savage in another forum) this struck me. I bemoan my own culpability on allowing the situation to get so bad; for allowing myself to give in to despair; for falling silent for months at a time. I attempt to make amends by coming back, either here or other sites, to write commentaries and essays. It is in the hope that some of my readers will join me in my campaigns to bring non-processed-for-the-masses thinking into the heads of many more people. It is still very hard to shake the knowledge that all the time I remain silent, talk jockeys are filling the void with their half truths. They seem to be at it 24/5 if not 24/7 with replays. I've been told, and I understand, that they get paid while I do not. I must still deal with the items of everyday life that really is my day job. Still, I cannot shake the feeling that I'm letting someone down by not engaging my talents more, humble as they are, to write of my observations and conclusions more often. It is to share with others from whose hopefully well-planned battles against tyranny our shared posterity is relying upon. I alone will not see to it that this great Nation is still around for posterity -- I will need the help of a great many like myself who see, or will come to see, the raw deal that Statism is planning for all humanity. If there is anyway I can say or do to help you prod yourself to do more so that you don't suffer from as many regrets as I possess, please let me know. I will see how I might be of aid. Statism doesn’t need to control all its leading opponents. It seeks out a few who have a handle or two and -- when the moment is ripe -- twists. Yesterday morning I heard Dennis Prager interviewing William Voegeli, author of "Never Enough: America's Limitless Welfare State." Dennis of all people should have made the connection I’m about to make. But he didn’t. From that radio interview it was clear that “Never Enough” parallels my exegesis of the Eden story. We had everything we could want materially. But we could not withstand God’s simple test of our control of our ego. When Eve fell or was pushed against the forbidden tree and saw that touching it didn’t kill her (as she mistakenly thought was the bar), she then listened to the voice that said that “God’s selfishness for His knowledge and power was why He barred her from eating of it” (targeting her sense of trust and undermining her obeisance and gratitude). Furthermore, she succumbed to coveting all that was His: "if you eat of it, all that is His could be yours." And then, once she ate of it, she couldn’t be alone in her sin, she felt the need to have company in sin. And so it goes. Back to the current dilemma: It’s not YOUR responsibility conservative Americans? Back to Eden: When quizzed, can’t you just imagine Adam explaining to God how he was totally misled by the woman? Right Adam, nothing willful in your being misled was there? It never occurred to you that you could give into temptation and blame someone else for the consequences, did it? Right? “No — not Me. Never. I swear.” God’s omniscience is a pisser ain’t it? Back to Now: Like we were misled by the “Progressives” into believing we could borrow until the cows came home and not worry? Mr. Prager: You want us to believe that there was no willful misleading maybe by you or any of your colleagues. Nor even that you have willingly permitted yourself to be misled. Do you Mr. Prager? When will you recognize how much bilge you are pumping? The whole time he was prattling on about liberals not having an evil bone (“proof” being that he loves them) in their bodies, I was reliving my behaviors and the feelings I carried in my guts after college gave me multiple rationales to take out my unresolved issues and hostilities on others in pursuit of utopia. Wishing for a World Devoid of Evil does not make it so. I swear, I can hardly stand listening to Dennis Prager because of all the “ultimate issues" he knows so well how to skirt. He’s worse than any hypocrite. He’s an enabler of the Statist advance. It was Doug's words which prompted me to the title of this post. Dennis Prager is a Rodney King who wants us to believe we can all just get along so he doesn’t have to confront his complicity in the disaster unfolding around him -- and us. It is not that they are oblivious to the Orwellian inference, I am beginning to think it is just the opposite, it’s a dare. That observation is by Two by Four at Belmont Club. It was prompted by the government contractors working on the domestic spying program "Perfect Citizen" who shared emails with the Wall Street Journal that boasted "Perfect Citizen is Big Brother." Think of a rodent burrowing into new ground that is soft like never before. With each new stage, it pops its weaselly head up to see if there’s any predators closing in. The varmint infestation is astonished at how easy its advancement has suddenly become. They can’t believe their luck as they continue on their rahming….